Roger Croft’s ‘The Wayward Spy’ is an intriguing tale of espionage that celebrates the spy genre. Lovers of the spy novel genre will find themselves entirely caught up in the fast-paced adventure of Roger Croft’s The Wayward Spy. Set in 1992, the events of the novel take readers back in time to experience the fascinating tale of Michael Vaux and his adventures. Michael Vaux, a veteran news reporter, had every intention of retiring early. However, those plans were waylaid by greater powers when the British Secret Service uncovers his youthful friendship with Ahmed Kadri, who, unfortunately for Michael, is now Syria’s chief armaments buyer. His retirement put on hold, Michael is tossed into a world of intrigue and upheaval. He agrees to a one-off deal with M16, who is convinced that Syria is poised to sign a multi-billion arms deal with Russia that might upset the precarious balance of power in the volatile Middle East. Michael disappears mysteriously during the Geneva Middle East Conference, during which Russia is secretly working out negotiations with Syria, and reappears later, photocopies of the arms deal in hand. While his bosses at M16 couldn’t be happier, the CIA steps in, certain that Michael’s version is false and the evidence a deliberate deception on Syria’s part. Michael is dispatched to Tangier, where his old friend Kadri has sought self-exile after a surprise coup by President Al Assad Shia’s supporters. Thrown back into the fray, Michael must now obtain critical intelligence and defense data from his old friend. The outcome of his trip shocks M16 as much as it shocks Michael. A classic spy novel with a unique twist, readers will be furiously turning pages until they reach the stunning conclusion of Croft’s newest spy thriller. A former journalist whose reports and feature articles have appeared in major publications such as the Economist, the Sunday Telegraph and the Toronto Star, Roger Croft has also worked in Egypt, where he free lanced and wrote editorials for the Cairo-based Egyptian Gazette. A Historical Novel that Speaks to Readers of All Ages Free On Kindle! Lovers of historical fiction will find themselves completely enthralled with Jack McGuire’s Joining Up, a powerfully moving story about two teenage boys living during the United States Civil War. Accurately portraying both the desperation and the bravery of the two main characters and the realities of the Civil War itself, screenwriter McGuire draws upon factual events to weave a tale that will reach readers, no matter their age. Bobby and Will are teenagers who have never had it easy. Facing mistreatment and misery at the hands of the dreadful headmaster at St. John’s Orphanage, Bobby and Will opt to run away and find their futures elsewhere. That “elsewhere” turns out to be in the ranks of Brooklyn’s Red Legged Devils of the 14th Regiment. The boys’ adventure takes them all the way to Pennsylvania, driven by the heroism and valor of the legendary Fourteenth. When they finally don their Union Blues, they become a part of America’s rich history, as the famous Battle of Gettysburg is on the horizon, and the Confederacy and the Union are about to meet in a way that will never be forgotten. A Civil War buff, author McGuire lends his knowledge and expertise to the details of the story, creating fictionalized conversations between actual historical figures that shine a new and unique light on the events of the Civil War itself. His protagonists, Bobby and Will, though born and raised during one of America’s most iconic eras, transfer easily to readers, as their courageous longing to serve their country reflects that of so many young men and women today. Joining Up is free on Kindle on April 24th! John Jack McGuire is a history major and screenwriter, whose fascination with the Civil War began early. Growing up within view of the 14th Regiment Armory, he became eager to learn more about the Civil War, and eventually found the inspiration for Joining Up. Los Angeles, CA, April 22, 2013 - After collecting literally hundreds of vintage tales of Hollywood legends over the years, Stephen Schochet not only wrote a book that everyone could enjoy on the glamorous, and not so glamorous, stories of Hollywood icons, but he is offering it free through Amazon’s KDP select program on April 22nd and 23rd. As explained in an interview with Reuters, this entrepreneur told two kinds of stories on his tour bus; origin stories – telling how things we take for granted came to be, and funny anecdotes. He not only read a lot of books to find his material, but also tried to meet people who were connected to the famous (like housekeepers) that he could garner some tidbits from! His book is a special blend of biography, history and legends that covers scandalous yarns on some of Hollywood’s greatest characters – from John Wayne to Marlon Brando. The eBook also covers little-known vignettes about such diverse genres from classic westerns like Unforgiven to vintage superhero movies like Superman and Batman. Hollywood Stories: Short, Entertaining Anecdotes About the Stars and Legends of the Movies! 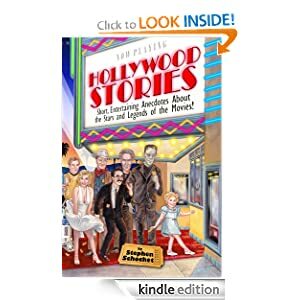 (Hollywood Stories Publishing) is packed with wild and wonderful short tales on many famous stars, movies and directors – anyone who has been a part of the world’s most fascinating and unpredictable industry! The author covers the gamut when it comes to situational stories; from the one about a lazy, well-paid Marlon Brando almost refusing to show up on the set of the 1978 movie Superman, then refusing to learn his dialogue and at one point having the lines penned on the bottom of his Superbaby’s diaper! Stephen also shares the story about blonde bombshell Marilyn Monroe, suggesting that rather than place her hands and feet in the wet cement at Grauman’s Chinese Theater for the premiere of her 1953 comedy Gentlemen Prefer Blondes, there were other body parts she’d be better remembered for. Hollywood Stories truly has something for everyone. It is a thoroughly entertaining book that features a remarkable cast of Hollywood’s legendary characters and icons and is jam-packed with surprising and funny tales with often unpredictable endings. No matter which page the book is opened on, there will be some fascinating part of Hollywood history to be savored! Schochet has been featured in numerous radio interviews as well as made appearances on television talk shows. Please view one here at: http://bit.ly/d8ALPq. Please read the LA Times article at: http://lat.ms/djjdyt and check out Stephen’s website: http://www.hollywoodstories.com to read the many reviews on his book. Stephen Schochet is willing to do in-studio interviews as well as on location at famous Hollywood sights, such as Grauman’s Chinese Theater, the Chateau Marmont Hotel, etc. - places that will serve as the perfect backdrop to some of his best stories. Tim Sika, Host of the radio show Celluloid dreams on KSJS in San Jose: “The best storyteller about Hollywood we have ever heard. Now more than ever, Americans are worried about retirement. These troubled economic times are weighing heavily upon working citizens’ shoulders, and many people are unsure of when, or if, they will ever be able to retire happily and with security. The very idea of retirement has evolved of late, leaving many Americans confused and concerned about what their futures hold. Between these difficult economic factors and the Baby Boomer Generation nearing retirement, never has expert and practicable advice about retirement preparation been so in demand as it is now. For Baby Boomers, running out of money is their number one fear. Luckily, Dennis M. Postema has just re-released his best-selling guide, Retirement You Can’t Outlive. In this new edition, which has been updated and expanded upon following the first release, Postema addresses Americans’ concerns about when and how to retire. Whether someone has retired early, only to realize that they don’t have enough saved to last the rest of their life, or they have been forced to retire early due to health, their employer, or job loss, Postema has guidance at the ready. No matter the circumstance, most people face the challenge of creating reliable, post-retirement streams of income—income that is truly designed to last a lifetime. This book gives readers a no-nonsense approach to ensuring a comfortable retirement, one that even inflation can’t beat. Retirement You Can’t Outlive will also help readers learn how to position their available assets correctly, so there’s no chance that they will ever outlive their money. This is a timely and valuable book to own, and readers are certain to appreciate Postema’s easy-to-read and informative prose. Most people have been struggling to survive the past few years of economic recession, nevermind worrying about retirement. Now, readers of Postema’s book can be prepared for what lies ahead. Dennis M. Postema is an entrepreneur and registered financial consultant. He was the 2012 recipient of the 10 Under 40 Award given by the Defiance Chamber of Commerce. His company, Postema Insurance & Investments, works with over 90 carriers, and has over two dozen agents and offices in five locations throughout Ohio, Indiana and Kentucky. He also launched Postema Marketing Group, LLC in 2009, to help independent agents across the country achieve their goals and see their agencies thrive. Postema released his first book, Retirement You Can’t Outlive, in 2012, and he has many exciting book releases slated for 2013 and 2014. Avoiding a Legacy Nightmare is slated to be a practical and legacy-changing guide to the hidden consequences of selecting the wrong beneficiaries for insurance policies, annuities and retirement accounts. Postema also has Financing Your Life, a comprehensive guide to every aspect of personal financial planning that a family can face, in the works. Dahlonega, Georgia – William McNally is proud to offer his debut supernatural work Four Corners Dark (ISBN 978-1463561857) available in bookstores everywhere. Imagine a world beyond our own. With Four Corners Dark, William McNally takes readers to the darkest depths of the imagination. Fans of horror and suspense will find story after story that teeters on the brink between spooky and downright chilling. In "Engine Eighteen", a group of Mexican immigrants attempt to cross a desert border to begin new lives, but end up paying a price for their old lives. "Return to Nowhere", is the story of a man who has the extraordinary ability to remake his lives and escape his pasts. "The Raven Mocker", a novella, tells the tale of a couple who encounters a dark force along the border between life and death. "The Spinning Wheel", examines the face of fate and the choice given to one man to change it. For readers who crave supernatural horror and science fiction and can't get enough of Stephen King, Clive Barker, Richard Matheson, and Dean Koontz...Four Corners Dark is your next book! Kindle users can download Four Corners Dark for FREE...from April 16th through April 20th, 2013. Visit Amazon.com for details. WILLIAM MCNALLY is the author of Four Corners Dark (ISBN 978-1463561857) and Beneath the Veil. He resides in Dahlonega, Georgia. The explosion of feral cats has led to serious environmental, health, and nuisance concerns. Property owners, environmentalists, and animal control agents need in of responsible and effective techniques can find in a new book by Stephen M. Vantassel, a wildlife damage management consultant. The Practical Guide to the Control of Feral Cats is a welcome antidote to the lack of information that is available about animal control in America. Stephen M. Vantassel has been educating the public about animal control for many years, and his guides are extremely useful for readers who want to do their part for animal welfare but are unsure of how to begin. This new text deals specifically with the dilemma of feral cats, a subject that many readers need information about. Feral cats are considered, by some, to be an epidemic in America—the result of cat owners choosing to not spay or neuter their pets. While there are many contributing factors to the influx of feral cats, all can agree that their presence can be problematic. The Practical Guide to the Control of Feral Cats provides specific information for property owners and environmentalists about dealing with feral cats. Vantassel goes into great detail about the biology, damage, and diseases that need to be kept in mind while controlling feral cats. With step-by-step instructions for trapping and management, this guide will surely become the go-to manual on the subject of feral cats. Stephen M. Vantassel is a wildlife damage management consultant and educator. He has published numerous articles on wildlife control topics and has also written several books, including “The Wildlife Damage Inspection Handbook”, “The National Wildlife Control Training Program: Core Principles and Information”, and “Dominion over Wildlife: An Environmental Theology of Human-Wildlife Relations”. Stephen has run his own wildlife removal company and presently works to educate clients and the public about wildlife damage management using research-based techniques. For more information,please visit http://wildlifecontrolconsultant.com. Read Stephen M. Vantassel’s blog at http://StephenVantassel.com. Visit Stephen M. Vantassel’s Facebook page at https://www.facebook.com/WildlifeControlConsultant. Author Elisabeth Stevens takes readers back to the tumultuous 60’s with her book, ‘Ride a Bright and Shining Pony’. Author Elisabeth Stevens brings readers another phenomenal novel with her book, Ride a Bright and Shining Pony. A novel set in one of American history’s most tumultuous time periods, Ride a Bright and Shining Pony gives readers a glimpse into the lives of the people whose lives were forever changed by the March on Washington for Jobs and Freedom, where Martin Luther King Jr. gave his well-known and inspirational “I Have a Dream” speech. Set, of course, in August of 1963, Ride a Bright and Shining Pony follows Cynthia, a young, ambitious writer for a New York history book publisher. Choosing to spend her two-week vacation in Washington D.C. with her boyfriend, Lester, she takes a bus straight into an unexpected turn of events. Hoping to have a quiet and romantic vacation, maybe even quietly get married to Lester, a newspaper reporter, Cynthia instead ends up being drawn into the March. Cynthia, a conservative Northerner, and Lester, a liberal Southerner, find that fate has other plans for them both. Unavoidably drawn into the March, the peaceful idealism and idyllic hopefulness of the event is followed by something completely different for Cynthia. In the space of twenty-four hours, Cynthia’s experience becomes riddled with racial violence, mayhem, and, for many, tragedy. Readers who enjoy their fiction with a twist of historical fact will be delighted by this well-written and powerfully moving novel. Recalling the glorious fight for equality in the early 1960’s, and still relevant today, Stevens grabs the reader and draws them in to a time that many may not have experienced, but none will ever forget. Elisabeth Stevens has written fifteen books of fiction, poetry, and drama. Born in Rome, New York, Elisabeth graduated from Wellesley College and now lives and works as a graphic artist in Sarasota, Florida. Her work has been exhibited around the country and she is a member of SAGA (the Society for American Graphic Artists). Toby Heale is another example of an author who understands what it takes to be successful. 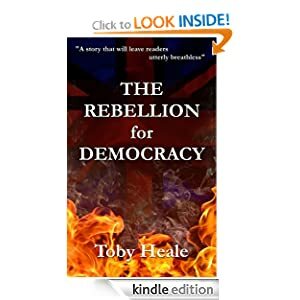 His title, The Rebellion For Democracy hit number one on Amazon.com's most downloaded Kindle book in the political category. He accomplished this using several different methods of book promotion. We were privileged to be involved in his campaign. Toby understands one press release will not generate the amount of exposure you need to sell books. It takes thousands of impressions over a period of time to generate sales. By offering a free download for a period of time and using multiple platforms for promotion, Toby generated outstanding results. McDonalds is one of the largest fast food chains in the world. However, they still market and promote on a daily basis to keep the product in front of consumers. You may not have the budget McDonald's does. However, you must do everything you can to promote your book. We have affordable marketing packages to give your book exposure if used on a regular basis. Do something as often as you can afford it.